I always will have a soft spot for unique pistols. From my IPSC 1911, to my semi-polished meat masher hi-capa, to my fully polished extended slide M9; I love semi-impractical GBB pistols. Well, in a departure from my normal tastes, Iâ€™m bringing you a review of a VERY practical GBB pistol, albeit one thatâ€™s two toned (to keep it just impractical enough to keep me happy!) Read on for more information about the TSD USP Compact, a snappy little shooter with a few surprises up its sleeve! In the early 1990s, HK was tasked with designing a new handgun that would be built around the .40 Smith & Wesson caliber that was fast emerging as the de rigeur caliber for American law enforcement. The USP is that pistol, originally designed for .40 S&W and not scaled up from existing 9mm designs. USP stands for Universale Selbstlade Pistole, or Universal Self-loading pistol in English. (OoneeverSalleh Zelbstlardeh Pistoleh.) It has been incorrectly labeled in major American gun magazines as the Universal Service Pistol. Using a modified Browning action with a special recoil reduction system, the USP covers new ground with the number of action variants that are changeable with only minor parts replacement. Introduced to the American shooting public in 1993 at the SHOT Show, the USP debuted in .40 and 9mm. As another HK first, integral frame rails for the mounting of on-gun lights and lasers was made standard, which most major manufacturers are now emulating. A natural follow-on to the full size USP series is the HK line of USP compacts. Like its bigger brothers, the USP Compact was first offered in 9mm and .40 S&W, before later being offered in .45 ACP and finally .357 SIG. I procured this gun directly from Team Specialized Distribution (TSD for short), in order to review it for you Airsoft Retreaters. I had seen this gun previously at a few retailers, and was very interested in the design, as well as some of its unique features. It is currently available at most major airsoft retailers, such as Evike, Airsoftgi, etc, and is priced between $100 and $115 or so, depending on the length (it is available with the short compact slide like the one Iâ€™m reviewing, and a longer slide) and the color (black or two-toned). This airsoft replica is a Gas Blow Back (GBB) pistol, modeled after the H&K USP Compact, 9mm, .40SW, or .357SIG, specifically, the Variant 5, albeit with a few changes, such as the fictional use of full auto, and the fact that it is single action only, even with a bobbed hammer, like the DAO. It is not modeled after the .45 ACP model, due to the shorter frame and slide. It has a metal slide, so it can use GG or Propane with ease. It also shoots full auto, which is a bit unrealistic, but is a fun feature nonetheless! The gun is manufactured by HFC for TSD. I was surprised when the gun arrived in a nice plastic case, lined with eggcrate foam to keep it secure during shipping. TSD does this sometimes, and itâ€™s a nice feature, as it provides you with a secure home for your new pistol. There are a few pictures of the model line, as well as a picture check list showing the model inside. The plastic on the case is a little thin, but should be fine for basic storage/transportation. This is a pretty no-frills package, including only the gun, the case, one magazine, a manual, warning sheet, and the warranty card that needs to be sent in to TSD. The warranty is in effect for 30 days from the date of purchase, and covers you against manufacturer defects. The M166 can be considered a â€œFull Metalâ€ replica, as everything thatâ€™s metal on the real gun is metal on this one. The metal parts include the slide, barrel, trigger, mag and slide catches, safety/selector switch, hammer, recoil rod, and magazine. Iâ€™ll go over the different sections in detail, starting with the frame. The frame is made of matte black plastic, but with no flex, bending, or other detrimental flaws. It feels very similar to my real Taurus PT145. There is a mild seam line along the bottom, but Iâ€™m finding more and more that real polymer framed guns have these as well, so Iâ€™m not terribly concerned. The grip features checkering on the front and rear, and textured side panels as well. You should have no issues holding on to this thing when firing. The checkering is more or less perfect, offering enough grip to be secure, but not so much as to cause discomfort. The front of the frame has a closed end USP specific rail for mounting lights, lasers, etc. You need an adapter to mount things on it, which is available at various retailers. There is also a lanyard loop at the bottom of the grip, behind the magazine. The trigger is a single action only design, which is not accurate to the real gunâ€™s specifications, but it functions with no issues. As such, when racking the slide (and therefore cocking the gun), the trigger moves back from its original position to the firing one. Trigger pull is smooth, and I would guesstimate the weight to be about 5lbs. It has 3mm of take up, with 3-4mm more of actual trigger pull to fire the gun, and a total pull of 10mm. There is one mechanical safety on the gun, and that is the 3 position lever located on the left side of the frame. The topmost position is safe, middle is semi, and the bottom is full auto. Clicking it to safe takes a good bit of effort, but taking it off safe and into the other fire modes is quite easy and smooth. When on safe, the trigger pulls entirely, but is disconnected from the rest of the firing mechanism. In my testing, I had no issues with the fire selector. The magazine release is ambidextrous, and is located at the base of the trigger guard. It is simple in operation as well as function, with a simple push down by either the firing hand thumb, trigger finger, middle finger, support hand thumb, or whatever other method you devise, releasing the mag to fall free. In case of a stuck mag (I never encountered one, but still), the sides of the grip feature indentions to help get your fingers on it and pull it out. This replica has a working slide catch, which on my model locks back when you have 1 round left in the mag. Whether this is by design, or just a defect, Iâ€™m not sure, but I kind of like the fact that itâ€™s a way of telling me that I have one round left. The catch is easily released by pushing down with a free finger, allowing the slide to slide forward with a very satisfying metallic clink. The slide is metal, and is the silver painted version on my gun. 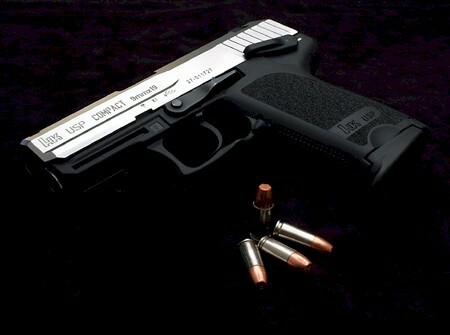 The gun can be had with two lengths of slide/frame, and in all black or two tone, like mine. The paint application is nice and even, with no major blemishes to speak of. It has a metallic finish to it, and looks just a tiny tiny bit cheap. The top of the slide almost looks brushed, which looks great, but unfortunately, on the rest of the slide is just plain silver. There were a few very small casting defects on the edges of the slide, but were easily removed with a fine flat head screwdriver. Iâ€™m not sure what metal the slide is made from, but itâ€™s taken the abuse Iâ€™ve thrown at it with ease. The outer barrel is metal, and has a matte black finish, contrasting with the slide, just like the real stainless steel slide equipped USP Compact. It is my one negative on the gun, as it has a good bit of free play up and down. Iâ€™ll be experimenting with machining a groove in the barrel, and mounting an o-ring, like the real USP, to see if it helps with the up and down play. It comes equipped with an orange plastic plug glued into the muzzle, which I removed for photo purposes. Removing it voids your warranty, so I do not advise doing it on yours. The hammer is bobbed, indicating this to be a DAO model, but itâ€™s actually a single action model. The sights are black, further contrasting with the slide, and feature white painted dots for enhanced target acquisition. They technically are fixed, but you can drift adjust them for windage. Overall, aside from a few negative points, such as the paint finish and the barrel wobble, the externals on this gun are exceptionally nice, especially for the price. The metal slide is nicely cast, and has handled my abuse thus far nicely. The rough textures used in the grip lead to a very comfortable and secure shooting experience. There are no real manufacturer trademarks on this gun. The only writing on it at all is a small â€œMade in Taiwanâ€ located on the right side of the frame. Itâ€™s very discreet, and doesnâ€™t really stand out at all. Itâ€™s so faint, that I wasnâ€™t even able to get a good picture of it. The included magazine is metal with a plastic base, and holds 18 6mm BBs in a double stack configuration. The base on mine has the extended finger groove, but Iâ€™ve seen pictures of this model with the plain flat base as well, so I canâ€™t guarantee the one that you will receive. Also, I do not know what magazines this is compatible with, aside from its own, but Iâ€™ll post detailed pics to help determine any cross compatibility. 17-19 RPS, depending on temperature, gas pressure, etc. Range was short, as expected, due to the very short barrel, somewhat low FPS, and non optimum shooting conditions. I was only able to hit a torso sized target about 80% of the time at 80â€™, using .25g TSD BBs. The hop-up is quite effective, and is an H-hop, so, for its size, itâ€™s a very effective little sidearm. Gas economy is fairly good, as Iâ€™m able to get 1.5 mags out of a single gas load, using semi auto, and spacing 2 seconds between shots. Disassembly on this gun is a piece of cake. First, remove the magazine, to render the pistol safe and empty. Then, pull back the slide about Â¼ of the way, so the notch on the left slide of the slide is over the corresponding lug on the slide catch, and push out the slide catch. You then just pull the slide forwards, and the gun is in two pieces. Once apart, you can see the hop-up adjustment wheel, located on the bottom of the hop-up unit itself. You can also see the hop-up unit, firing mechanism, and other goodies that make this thing go bang. I was very pleasantly surprised by this model from TSD. It surpassed my expectations, and is quickly becoming a favorite pistol of mine. From the unique look to the hilariously fun full auto, this gun should turn some heads on the field. Itâ€™s plenty skirmishable, and is ready to jump into your holster of choice and join you in combat!